Joni appears on stage with her dulcimer.
" Love is touching souls " is my favorite line from this song, and a profound lyric. Text added to this video states the song is about Graham Nash, which -- i guess that must be correct since this is her official site -- i have always thought was about JT. The line " i met a woman... " i thought was Kate (Probably because JT adds his beautiful guitar...) Oh well, another misconception bites the dust. 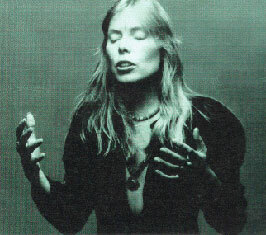 Pulling for you, Joni ! This song from her Blue album is probably my favorite among ALL her recordings. But while I'm generally not a fan of "live" recordings, this knocks the socks off her original! I never dreamed it could be transcended.